10781 ft (3286 m) . Mount Baker is a large and very prominent stratovolcano located in northwest Washington State near the Canadian border. Nearly completely encased in ice, it hosts the second largest glacial system in the contiguous United States (after Mount Rainier). 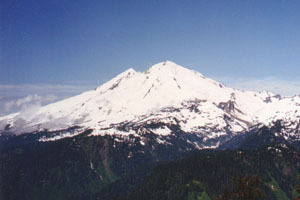 Mount Baker receives tremendous snowfall, averaging well over 600 inches (15 m) annually, and during the 1998-99 snow season a new world record of 1140 inches (29 m) was recorded at the nearby Mount Baker Ski Area at 4200 ft (1300 m). The massive snowpack permits safe and fun skiing on large, active glaciers such as the Coleman and Easton throughout the spring and well into summer (roped travel is recommended on the ascent, though). Several mid-elevation areas on the north and northeast sides remain skiable year-round, and in good years the Squak and Coleman Glaciers remain so too. (22 km) Normally done as an ice climb, with a deep snowpack this is a viable steep skiing route. Mostly 40-50 degrees except for one pitch of 70-degree ice near 9600 ft, where a rappel would probably be needed. The route could be climbed to that point and the ski descent done from there back down to the Coleman Glacier. Has somewhat less objective hazard than most other extreme routes on the Cascade volcanoes. (35 km) A steep, heavily crevassed route, which starts with a very long (and somewhat up-and-down) traverse from the Mt Baker ski area, which negates the advantage of the high starting point. 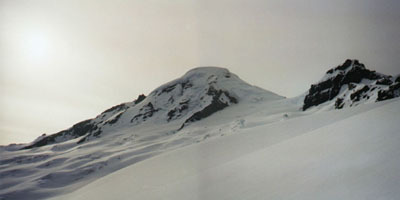 Combined with the Coleman Glacier route, it forms a challenging ski traverse route first done in 1939. A ski traverse via the easier Easton-Coleman combination was done earlier in 1932. (26 km) A good alternative to the crowds and noise on the Easton. 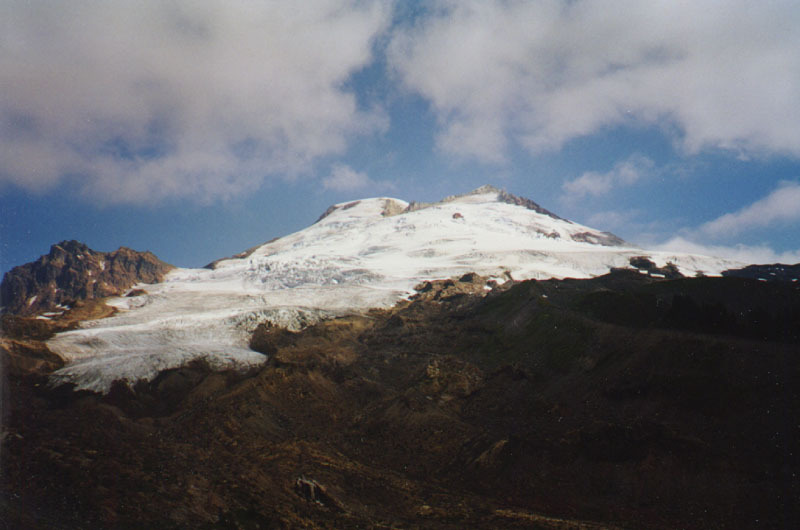 However, the Boulder Glacier was greatly reduced in mass by a lahar (volcanic mudflow) in 1988, and might be too broken up for good skiing except early in season. (22 km) Many ski tour possibilities which are easily accessible by traversing from the Mt Baker ski area. Good summer skiing. This is also the lower portion of the Park Glacier route. (16 km) Another good route for summer and even fall skiing. Can connect with a traverse across Mazama Glacier over to Sholes Glacier and Ptarmigan Ridge. Full page descriptions and photos of Easton and Coleman routes. with Colfax Peak (9420 ft) at right, the highest of the Black Buttes.